Bring a rustic touch of the woodlands to your table with the Ceramic Bear 16-Piece Dinnerware Set. 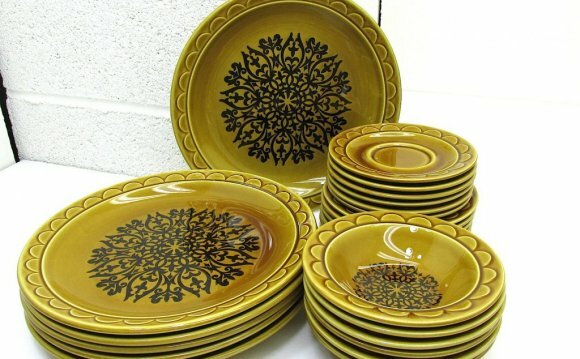 With place settings for 4 people, these ceramic dishes feature artwork of bears, paw prints, and pine trees in natural greens, browns, and golds. Includes coffee mugs, dinner plates, salad plates, and bowls in slightly irregular handmade shapes. The 16-piece Bear Ceramic Dinnerware Set makes a fun and engaging addition to your wildlife- or nature-themed décor. 4 of each: 16 oz. mugs, 10.75" dinner plates, 8.5" salad plates, 5.75" x 5.75" bowls. Imported.